These appear in 4s in many iterations of the Imperial Shuttle, and also many of the X-wing, as well as the MT-201 Ultra-Drill Walker and the SP Undercover Cruiser. I can't say for certain which of these sets originally contained those pieces, but this should get you closer. This list also shows sets that contain the piece in smaller quantities. That is a Cylinder 3 x 6 x 2 2/3 Horizontal Item No: 30360. In white it appears in a number of sets as listed in the already existing answer. 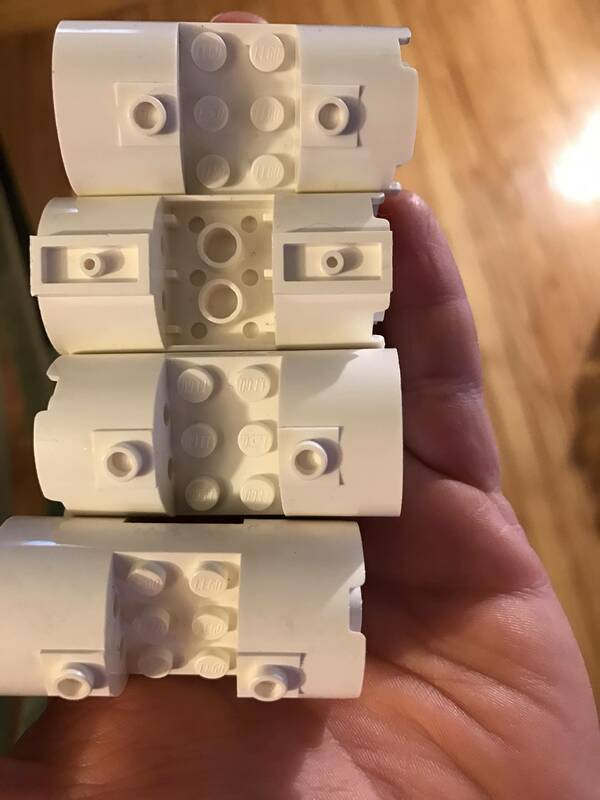 According to brickset, this piece is either the 3x3x6 engine or this other 3x3x6 engine piece. They are both pretty similiar, but I think they differ in the amount of studs in the tubes on the side. Alternately, you could check out their group/piece class here for the first piece that I mentioned above, or here for the second piece. I might be mistaken though, since I have that piece at home, and Brickset may be referring to the same piece, but at different angles/sides. You can check what set they come in simply by clicking on "sets" on the side bar labelled "part details". If you are checking out my 3rd or 4th link, simply click on each link that you would like to open, and click on "sets" as I mentioned above. It must be parts from the set LEGO X-Wing 9493. Here it is on Bricklink. What set(s) are these pieces from?